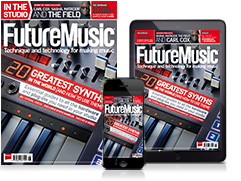 Modular synthesis has become increasingly fashionable in recent years, but it remains a notoriously wallet-sapping way of making music. It’s not so surprising, then, that we’re starting to see brands present more affordable and accessible ways to get in on the patching action. 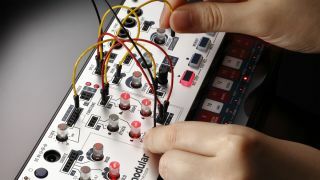 NAMM 2019 saw the launch of two such hardware products, from Korg and Teenage Engineering, both of which put the experimentation-focused ethos of modular synthesis into the hands of cash-strapped producers. The more expensive and, arguably, more innovative of the two is Teenage Engineering’s new Pocket Operator Modular range. This currently consists of a trio of self-build modular systems which make use of flat-packed, bendable aluminium cases with AA battery power units, making them considerably cheaper than most standard Eurorack cases. Despite the name, these systems are closer to desktop than pocket sized; this is a good thing, as it means they don’t feel too cramped when editing patches and can make use of proper 3.5mm Eurorack-style inputs and outputs. The fact that the PO Modular is, to some extent, Eurorack compatible is what’s innovative here. At $500 for the flagship 400 system, this isn’t the most outright affordable patchable gear on the market, but the potential for a little DIY expansion is definitely exciting. Teenage Engineering refers to the pre-configured chassis as ‘almost disposable’, and while the POs still feel solid enough for most day-to-day use, there’s an implicit suggestion that these system are designed to eventually be deconstructed and reconfigured as the user’s hunger for modular experimentation grows. To use the individual modules in a standard Eurorack case, you’ll need to build yourself a DIY faceplate. Teenage Engineering promises to share easy-to-follow instructions on how to do this, although we’re hoping it may decide to bring out its own cheap conversion kits in the future (you can bet third-party options will be on the market pretty soon, too). Right now, the PO Modular gear is only available in three pre-configured systems - the three-oscillator 400, single oscillator 170, and 16 keyboard/sequencer. Individual modules will be available later this year, though, which should open up options for changing and re-imagining these. We got our hands on the 400 system at this year’s NAMM. Sonically, we’d say we’re initially impressed with the quality of the oscillators and filter, but it’s a little hard to really gauge these things without spending a proper amount of time with them. In terms of the modules available, neither the 170 or 400 are particularly adventurous; the combination of oscillators, filters, envelopes and LFOs are bread-and-butter analogue synth fare, with little functionality that isn’t widely available in other budget synths. That said, with plenty of patch points, there’s still a lot of room for experimentation, and given that these systems are aimed at introducing newcomers into the world of modular synthesis, keeping things fairly straightforward to begin with seems like a sensible choice. As a statement of intent, it’s got us very interested. If Teenage Engineering keeps developing the range with expansion options, DIY kits and perhaps a few more esoteric modules, there’s potential for it to grow into something truly fantastic. If the PO Modular gear is a little vanilla in terms of its sound engine, Korg’s Volca Modular is anything but. Given that this is the first modular entry into the company’s compact Volca range, you might have expected Korg to stick with a fairly straight-forward subtractive semi-modular design. To the company’s credit, the Volca Modular uses a far more esoteric, West Coast style that’s influenced by the designs of Don Buchla. As a result, it boasts interesting tools such as a wavefolding oscillator, and two low-pass gates in place of a more standard amp and filter combination. There’s an excellent digital Space processor, too, which generates a slightly otherworldly reverb-like effect. The sequencer packs some unusual tools as well, including microtonal capabilities and a semi-randomised Stochastic playback mode. Notably, this is the first Volca to ditch the MIDI input, in favour here of a stereo CV jack alongside the usual pulse sync in/out. As a result of all this, the Volca Modular is likely to feel a little daunting for less experienced producers. Fortunately, it really rewards experimentation and provides a great tool for introducing concepts like generative patches, atonal sound design and complex oscillator modulation. In terms of the hardware design, the micro-sized pin patch leads it uses are a little fiddly and easy to bend out of shape. With complex patches the interface can quickly get cramped and fiddly. It’s a shame there isn’t more in the way of 3.5mm I/O, too. The pin patch points are clearly a necessity to fit a semi-modular architecture into the compact Volca frame, but it would have been great to be able to have a few extra outputs, particularly from the upgraded sequencer, which could make a great tool for driving external gear. Both the POs and Volca feel like entry points into newly accessible worlds of synthesis, albeit ones that take slightly different paths. With its easier to understand synth engine and DIY expandability, the Pocket Operator range has all the makings of a modular gateway drug, inspiring those used to pre-routed instruments into a new realm of patching and re-wiring. The Volca Modular, on the other hand, is sure to turn a wider audience on to the weird and wonderful sounds of West Coast synthesis.